The 2010-11 Madison Metropolitan School District budget is once again front, center and all places on the Board of Education agenda. The main meeting starts at 5:30 (after an Exec session on student discipline cases) in the Doyle Administration Bldg. Auditorium (545 W. Dayton Street). It is a “workshop” meeting and that means no public testimony (people who have comments on the budget should continue to write the Board at board@madison.k12.wi.us). 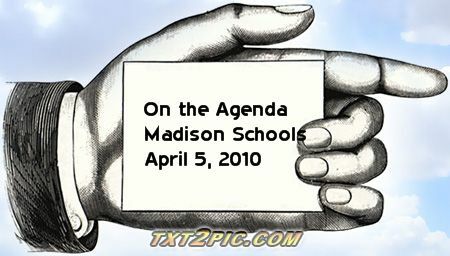 Like almost all Board meetings, this will be carried by MMSD-TV. A couple of notes and then onto the agenda. First, as scheduled the Board did receive Budget Books for 2010-11 last week; I’ve been told it will be posted on the district website on Monday ( I assume on the Budget page). The Q&A have been pretty active and are worth working through, to get more information and glimpses of Board and Administration thinking. I’d especially recommend “Q & A – Discussion Items 229 and above” which covers items not directly among the options presented by the Administration. First up is “2010-11 Budget Development Process and Timelines.” I hope there is a new timeline presented, because the one that is on the website has been out-of-date for some time. When I asked about this some weeks ago I was told to use the Board Calendar instead, but the information there isn’t very detailed. I also hope that there is no discussion/evaluation of the process at this time. I think many — on the Board, in the Administration and among the public — have thoughts about what has worked and what hasn’t, but now is not the time. Once this is over, I do think some evaluation and changes are essential. Next comes the “Overview of MMSD Financial Picture” consisting of Impact of state’s finances on MMSD finances and budget projections, 5-year budget forecast and Tax impact projections of 4K implementation. I’m fairly certain that the first is the only new document. In consists largely of Legislative Fiscal Bureau (LFB) memos from January and February and a PowerPoint by Prof Andrew Reschovsky. Whether local or state, the forecasts aren’t good. For MMSD the the expiration of the Maintenance Referendum and the limits of the operating referendum will — with or without 4K, but more without — the structural gap between allowed revenues and cost to continue budgeting kicks back in at between $3 Million and $6 Million from 2012 forward. That assumes taxing to the max and the max will require property tax increases estimated at about 12% for 2010-11, about 9% for 2011-12, about 6% for 2012-13, 4.5% for 2013-14, and about 3.25% for 2014-15. At the state level, the projected structural deficit for the 2011-13 biennium is $2.3 Billion. There may also be more bad news from the state. Recent tax collections have not met projections thus far. According to Steve Walters at WisOpinion, the hope is that two of the good things that were done in the last budget — increasing the Capital Gains tax and raising the highest income tax rate — will help enough to avoid a budget reconciliation (if GPR projected expenditures exceed projected revenues by 0.5% the “emergency” adjustment comes into play). It is time for state officials to take their heads out of the sand and address the short and long term needs of the state, including education. As I noted above, some positive steps were made in the last budget (I’ll add closing the “Las Vegas Loophole” and the Homestead Credit adjustment), but they clearly are not enough. For the short term, the Penny for Kids campaign has the best solution. For the long term, school funding still needs the big fix and Wisconsin needs real revenue reform (see the the Institute for Wisconsin’s Future/Wisconsin Council on Children and Families Catalog of Tax Reform Options for Wisconsin). The Facilities Assessment is next (memo, spreadsheet). It looks like $85 Million over 5 years, with much of that needed sooner rather than later. More bad news. Susan Troller Doug Erickson has more at the Cap Times State Journal. There are plenty more in the report. I hope no one is confused by the illusion that “keeping cuts from the classroom” means IRTs are expendable.